W5466NE - "TOGETHER WE CAN MAKE..."
New! 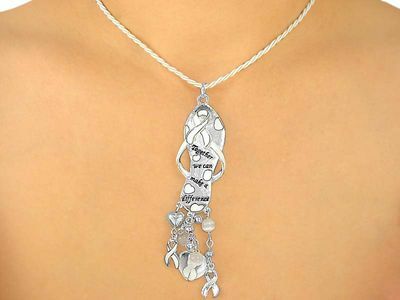 Off-White Twisted Cord Lobster Clasp Necklace Suspends A Silver Tone "Together We Can Make A Difference" Flip-Flop With A White Ribbon. Dangling From The Bottom Of The Flip-Flop Are 3 Heart Charm Chains. 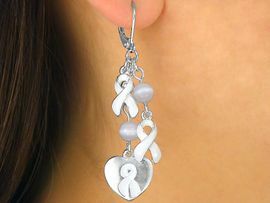 Two Have White Ribbons, And The Middle Strand Has A Silver Tone Heart With A White Ribbon In The Center.